Clemson WR Mike Williams has great blend of size and speed. Jourdan Lewis, CB, Michigan (5'10, 176): (8) Wisconsin at (4) Michigan, 3:30 p.m.
Lewis is small, at 5'10, 176, and therefore he's likely to be drafted later than he should, but he is a great football player who could be a steal for someone. It's extremely difficult to get separation on Lewis, who is as sticky a cover corner as there is in college football. Against the Steelers, the Eagles only had three corners dress on game day. Their need for more depth at corner is obvious. Freddie Stevenson, FB, Florida State (6'0, 243): North Carolina at (12) Florida State, 3:30 p.m. Yes, a fullback. Heath Evans would be so proud of me. Jokes aside, Doug Pederson said in a rather matter-of-fact manner that he wanted to add a fullback to his offense. "Down the road, as we go, if we can develop a fullback at some point, we will do that," said Pederson. "We're constantly looking at that position, not only around the National Football League, but on our roster." And, well, you get the idea. Stevenson is also a competent receiver out of the backfield, although with so many other other weapons in the Seminoles' offensive attack, he wasn't often used that way. Stevenson could be a very good fit in Doug Pederson's offense. Corey Davis, WR, Western Michigan (6'3, 213): Western Michigan at Central Michigan, 7:00 p.m.
OK, so nobody is actually going to watch Western Michigan at Central Michigan, if that were even possible, but WMU has a player worth mentioning at the wide receiver position in Davis, who some believe could be a first round pick in the 2017 NFL Draft. I'll reserve judgment on that for the 2017 Senior Bowl, where Davis is certain to get an invite. With 4180 career receiving yards, Davis is seven yards away from the all-time MAC conference receiving record. To note, the MAC has produced receivers such as Antonio Brown (Central Michigan), Julian Edelman (Kent State), Randy Moss (Marshall, then in the MAC), Greg Jennings (Central Michigan), Brandon Marshall (Central Florida, then in the MAC), Andrew Hawkins (Toledo), and Lance Moore (Toledo). As you can see in the above video, Davis has size, speed, and hands. Cordrea Tankersley, CB, Clemson (6'0, 195): (3) Louisville at (5) Clemson, 8:00 p.m.
As noted above, the Eagles' need for more corners is obvious. 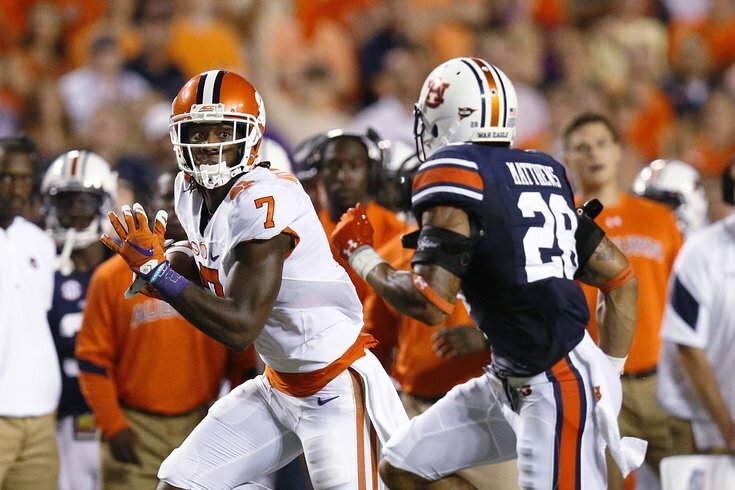 Mike Williams, WR, Clemson (6'3, 220): (3) Louisville at (5) Clemson, 8:00 p.m. He missed the remainder of the season, and there was a question as to whether he'd ever play again. After healing fully, Williams was ready for the start of the 2016 season, when he went off for 174 yards on 9 catches against Auburn. The Eagles' clearly need to continue to give Carson Wentz more weapons in the passing game.